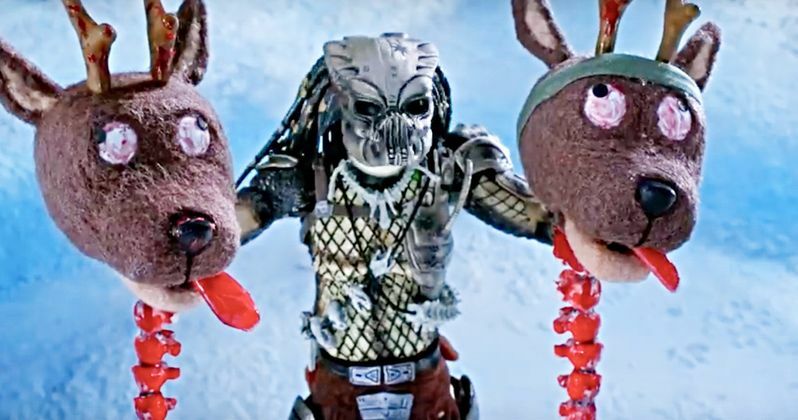 The Predator Holiday Special is here to bloody up your Christmas. After years of collecting dust, Fox finally brought back the classic sci-fi franchise this year with director Shane Black's The Predator. Reactions to the movie itself were a bit mixed, but with the movie making its way to Blu-ray, the studio decided to get a little clever with the marketing by making this stop-motion, holiday-themed, ultra-violent short. It aired earlier this week on Comedy Central, but now it's been released online for all of us to take in. Needless to say, this is NSFW and definitely not safe for children. Viewers have been warned. The short recalls the most classic of classic holiday specials, Rudolph, the Red-Nosed Reindeer. But most of the red here is blood and, for fans of this franchise, it's the Christmas treat we didn't know we needed. One by one, the iconic alien hunter starts to take out Santa's magical reindeer who, though seemingly capable, are no match for a Predator. Those who may not have the stomach to watch holiday icons get their guts spilled, limbs shot off and spines ripped out need not apply. Everyone else, enjoy. It's really the ending that makes the whole thing worth a watch. Not only does Santa himself get in on the action, with a few good one-liners, but there is an excellent callback to one of the most memorable moments from the original Predator that fans will surely appreciate. Plus, there is a certain Easter egg from a certain other franchise involving aliens that, the powers that be willing, will result in another messed up animated holiday short in the future. Like any good horror-related piece of media, it's laying the groundwork for a sequel. As for The Predator itself, the general consensus from critics seemed to be that this wasn't quite the reboot that we had all been waiting for. Instead of taking things back to basics, director Shane Black opted to open up the world quite a bit and, while quite a few moviegoers enjoyed it as the popcorn flick it turned out to be, this didn't turn out to be the franchise kickstarter that many hoped it possibly could have been. With a reported budget of $88 million (which actually seems a bit low considering what made it to screen, not to mention the reshoots) the sequel made just $160 million worldwide, and only $50 million domestically. Unfortunately, with the Disney purchase of Fox set to close early in the new year, this could be the last we see of the franchise for some time. This isn't exactly on-brand for Disney and, given what happened with this movie at the box office, they probably won't see the need to invest much in it once they're in control. But at least for now, we have this very fun, violent addition to the holiday special canon. Be sure to check out The Predator Holiday Special from the 20th Century Fox YouTube channel below.